Dr. Winston Isaac has always had a passion for teaching. It’s a passion he first realized shortly after finishing high school in St. Kitts-Nevis in the Caribbean, tutoring his peers in math, basic sciences and accounting. It continued after he arrived in Canada when he enrolled in the Respiratory Technology program in the early 1970s, when The Michener Institute was still known as the Toronto Institute of Medical Technology. It’s a passion that continues to this day through his contributions to health human resources management, men’s health advocacy and health education and mentorship. It’s a passion that sparked a remarkable career in healthcare and earned him the top honour from The Michener Institute of Education at UHN. The Board of Governors of The Michener Institute has announced that Dr. Isaac, a dedicated leader, mentor and advocate in health care education, is this year’s recipient of Michener’s Honorary Diploma in Health Sciences. “From his time as a Michener student helping classmates in respiratory therapy laboratory sessions, to his time as a Michener faculty member, to his student practicum placement work at the Ryerson School of Health Services Management, Dr. Isaac exemplifies what leadership and guidance means,” says Cliff Nordal, Chair, Board of Governors at The Michener Institute. The Michener Honorary Diplomas are awarded to individuals who demonstrate leadership and commitment to healthcare and who are dedicated to the advancement of applied health sciences education. This is the 14th Honorary Diploma in Health Sciences awarded by Michener. “I am thrilled to accept such a prestigious honour from The Michener Institute; my alma mater, no less,” says Dr. Isaac. 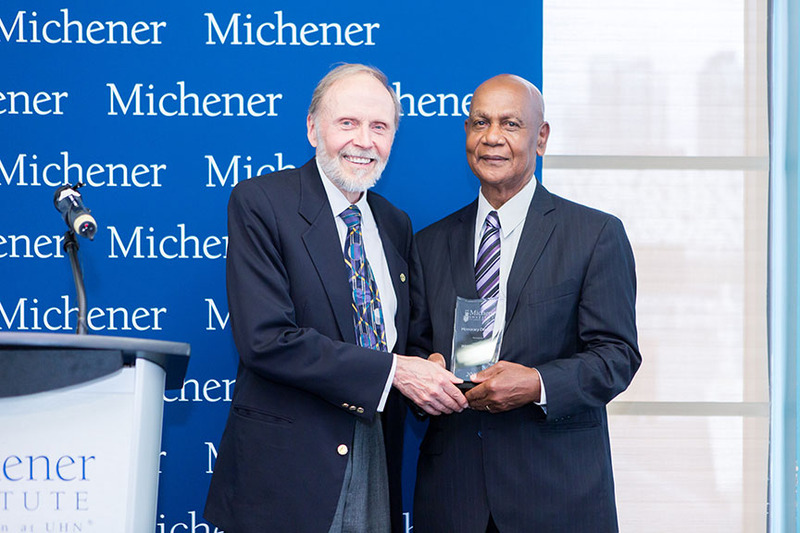 “So many individuals who have passed through Michener’s doors remain a strong part of this school’s ecosystem, including leaders like Dr. Isaac,” says Dr. Peter Pisters, President and CEO of UHN. Dr. Isaac has been associated with Michener’s Respiratory Therapy program for more than 45 years, first as a student in 1971, then as a Clinical Coordinator in 1976, and later as the Program Director until 1989. In 2013, Dr. Isaac received the Alumnus of Distinction award from The Michener Institute, and he continues to support a Michener Respiratory Therapy student scholarship in his name. Throughout his distinguished career, education and mentorship remained at the forefront of his approach to healthcare leadership. Dr. Isaac has worked with the School of Health Services Management at Ryerson University since 1995, teaching health policy and health human resource management, and he was the Director of the School for two terms. Dr. Isaac received his Master’s in Education from Central Michigan University, as well as a Master’s of Public Administration from Queen’s University. He received his PhD in Adult and Continuing Education from Michigan State University. Dr. Isaac’s experience extends to various levels within the Ontario healthcare system, in areas from acute care to rehabilitation to chronic and complex long-term care. He has also worked as a Health Policy Analyst and is a Certified Health Executive of the Canadian College of Health Leaders. In 2007, he founded the Walnut Foundation to offer help and education to men diagnosed with prostate cancer and to empower men to take responsibility for their health. The Honorary Diploma will be formally conferred on Dr. Isaac at Michener’s 2017 Convocation ceremony on June 24. The Michener Institute honours Honorary Diploma Recipient Dr. Winston Isaac from The Michener Institute on Vimeo.